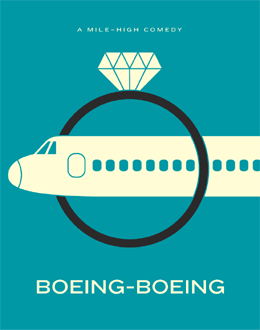 “Drink up, were in for a bumpy night” certainly describes the plot of The Arts Club’s current production, Boeing-Boeing, written by French playwright Marc Camoletti. The play encompasses such crowd pleasing aspects (and personal interests of mine) such as French music, the sixties, and physical comedy. I was lucky enough to attend the opening night, when the pressure is on and the stakes are high, and the production definitely didn’t disappoint. Opening night experiences are always seemingly glitzy and glamorous, the audience buzzing with excitement, everyone thrilled to be witnessing such a special performance. The house was full, the bar was busy, and the sixties ideals of peace and love seemed to be abound in the air. As the audience settled into their seats and the lights dimmed, I couldn’t help but grin at my good fortune. The physicality of the performances was superb and the appreciative audience reacted with abundant laughter- I even saw a few knee slaps. The tears of laughter came later as the tension, conflict and farcical comedy grew to new heights in the second half. The plot structure struck me as similar to A Christmas Carol, albeit a more modern and romanticized version! Bernard is visited by his friend Robert (played by the hilarious Will Ferrell-esque Andrew McNee) who then stays by his side during his rendezvous’ with all three ladies, resulting in a life changing epiphany at the end. If the stress the leading character undergoes doesn’t convince you of monogamy I don’t know what will! All in all, a great laugh and guaranteed comedic relief- what else would you want in the dreary and depressing winter months?